Happy Thursday! 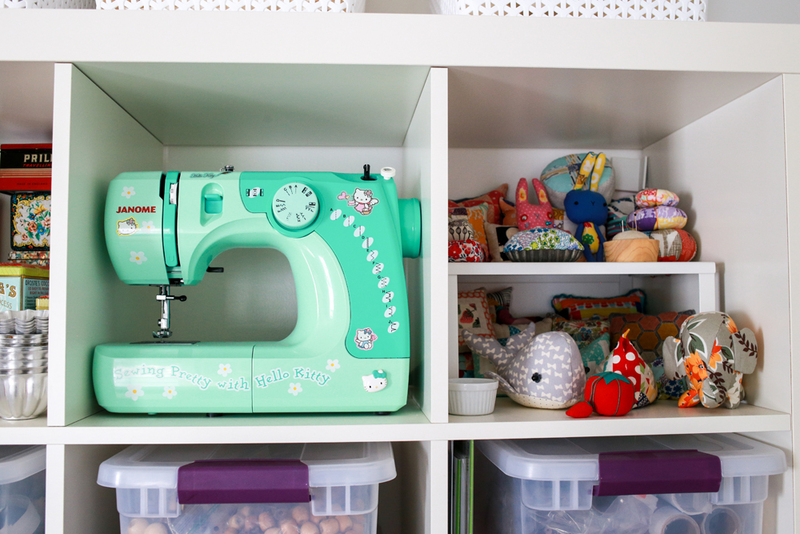 I thought today it would be fun to do a little sewing room tour! I've shown photos here and there of my space, but now that we've been in our home for a year, I figured it was time to give a proper tour of my workspace. Fair warning, this is a photo heavy post! I'm very lucky to have an entire room in our house to dedicate to my sewing. It's in an extra bedroom on the second floor, and it gets lots of morning sun. Plus there is access to the walk-up attic from this room which is convenient for storage. I was so happy when I realized I could squeeze both of my tables along the wall where the ceiling slopes. I remember tearing pictures of an attic craft room out of a copy of Martha Stewart Living many, many years ago that had a similar set-up. I thought it was so lovely and cozy, and it is! The tables were given to me by my Dad, who bought them out of an old schoolhouse that was closing. I've got a cutting mat on each table, and plenty of space to spread out. 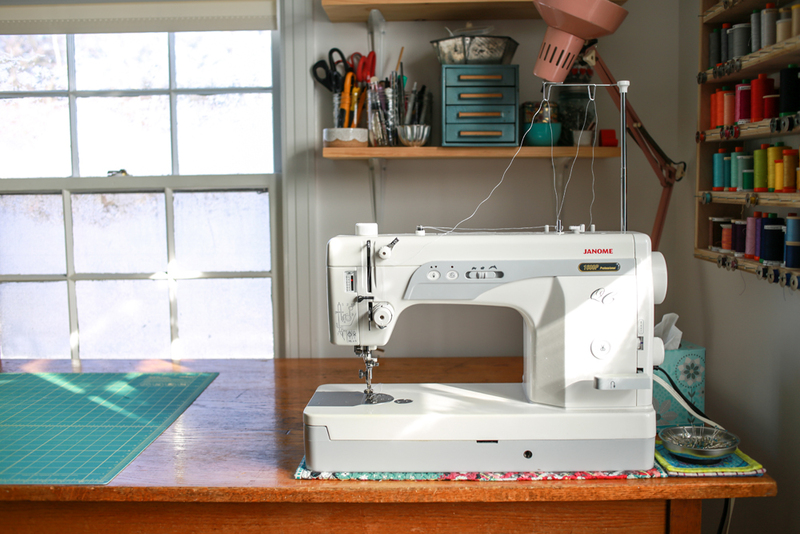 My sewing machine is on the end of the room with the two windows, which is great. Note: I sew on a Janome 1600P, see my review of this machine here. My serger is set up on the other table! I also have room to pull out my older Janome machine if I need to sew buttonholes or use any special stitches. Note: My serger is a Juki MO654DE. 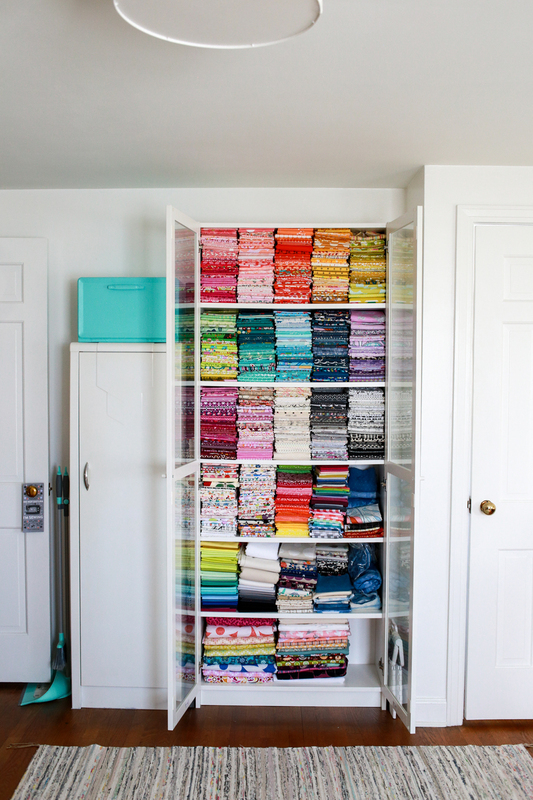 My quilting cotton fabric stash is housed in a Billy bookcase (with glass doors) from ikea. I wanted the doors to help keep the fabrics protected from sun damage. Thankfully it doesn't get any direct sun! Next to that is a metal cabinet (vintage) that houses most of my garment fabrics and larger cuts of canvas, linen, etc. 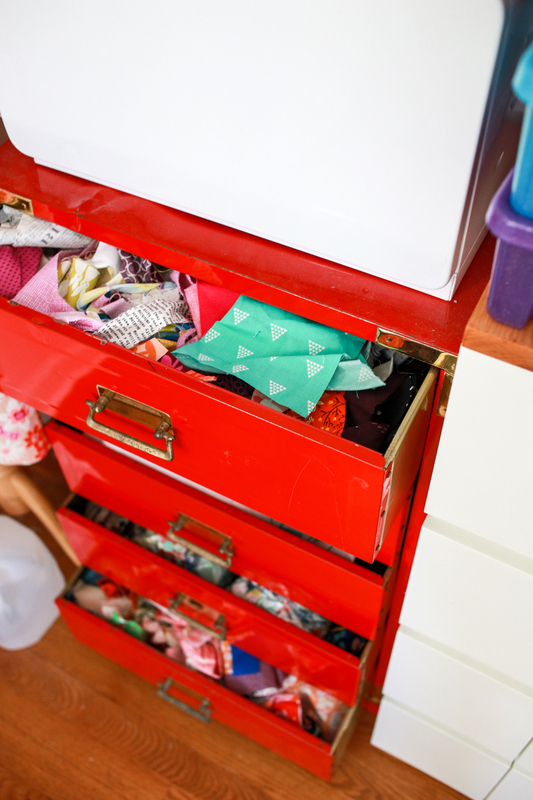 My scraps could be a little more organized, but I keep them somewhat tidy in this red vintage metal chest of drawers. Sensing a theme? I love vintage metal! This old metal breadbox holds my liberty of london stash! Opposite my sewing tables is this big cubby unit. It's the largest Expedit from ikea, which has now been replaced by the Kallax line. This was quite a challenge to take apart and move, but it survived! 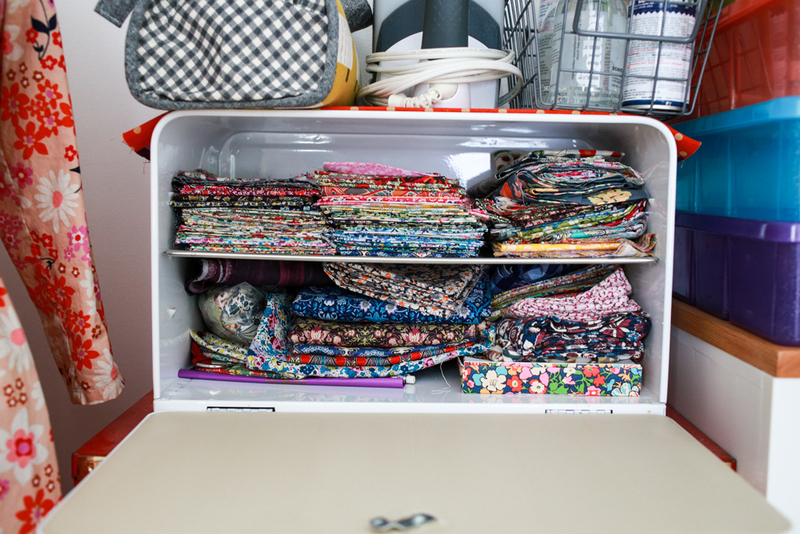 It holds my vintage sheet stash, some collections, notions, hardware, patterns, interfacing, works in progress, and more. How about a little peek at the top cubbies? First up, some of my vintage sewing machines! 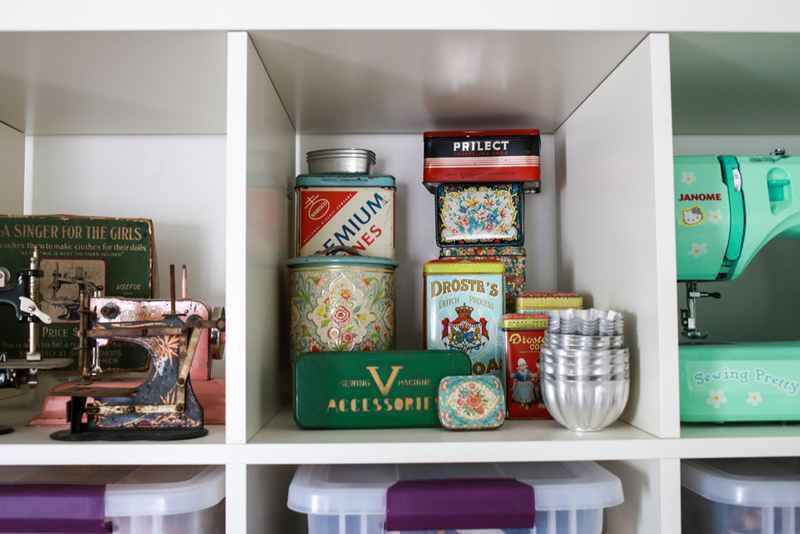 Next, a few vintage tins, including a sewing machine accessories tin and my Droste cocoa tins! My Hello Kitty Janome sewing machine, and some of my pincushion stash! I have a small wall shelf for my pincushions, but I haven't figured out where best to hang it yet! 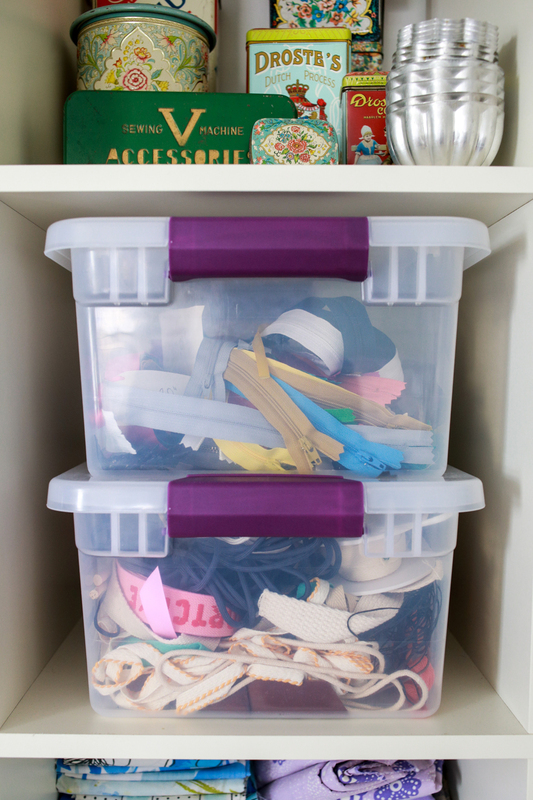 This shelving unit holds a lot, in part thanks to my very favorite storage containers! These are 15 quart Sterilite ClearView Latch Bins from Target. I bought my first one a couple years ago because of the purple handles, but quickly realized how great they were. Two stacked can fit perfectly in the cubbies. The internal dimensions of the Expedit vs. Kallax units are the same, so you should be able to use these in Kallax units in the same way. 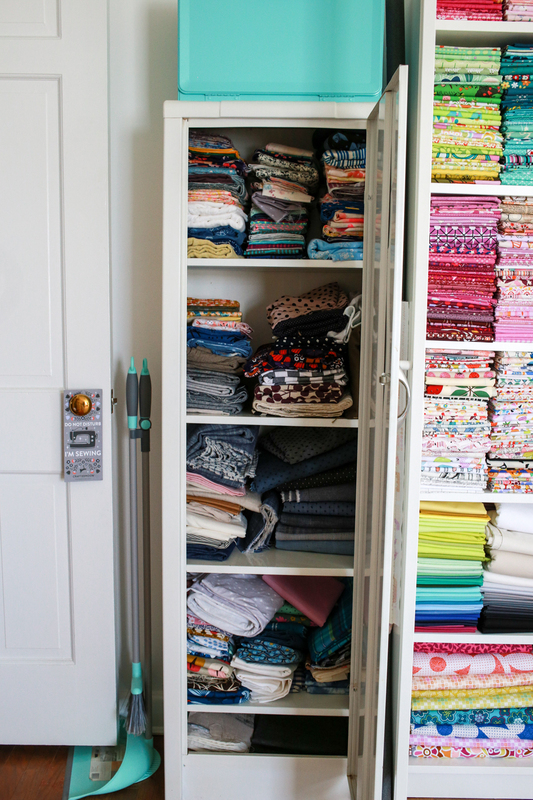 I use them downstairs to store my paper pattern inventory too, it would be scary to count how many I own! A few months ago I made this thread shelf to store all my thread and bobbins. It hangs next to my sewing machine for easy access. I shared a tutorial for how I made it here: DIY Thread Storage Shelf. 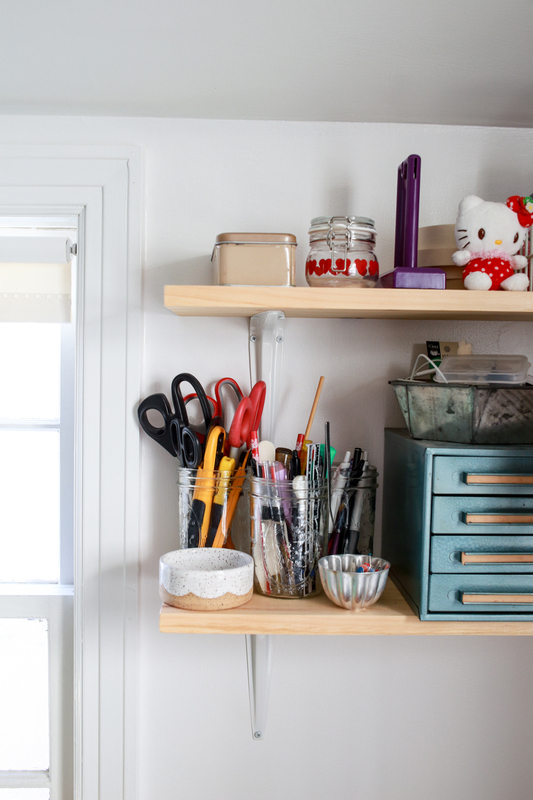 I hung up a set of two shelves on the wall behind my sewing machine to keep tools handy, but off the table. It's also a great place to put a few cute things! One of my favorite things I've found thrifting here in CT is this vintage pink lamp. It wasn't in super great shape when I found it, and it was only $2! After a little TLC it's working great! 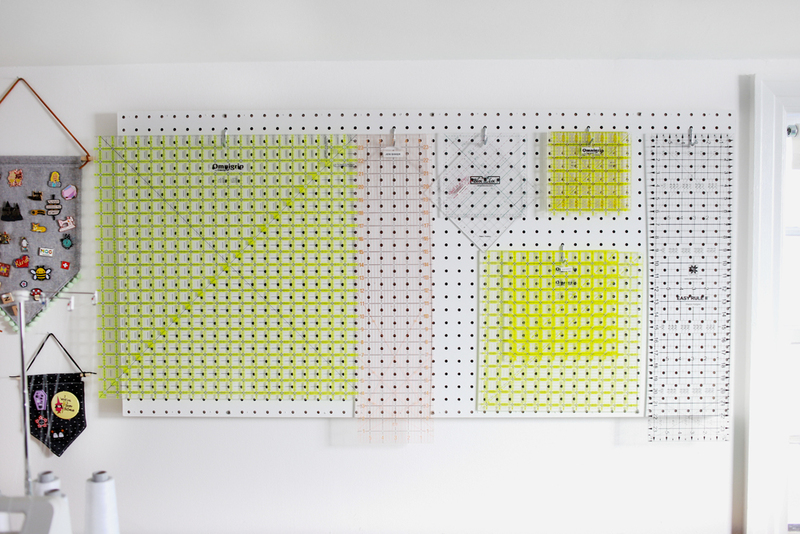 Another DIY project I tackled for my sewing room was a pegboard! I've wanted one of these for a long time, but didn't really have room (or the tools) in my last space. I used this tutorial to make mine. It's so useful! I haven't hung much up on the walls yet, but I did hang up my pin banners! 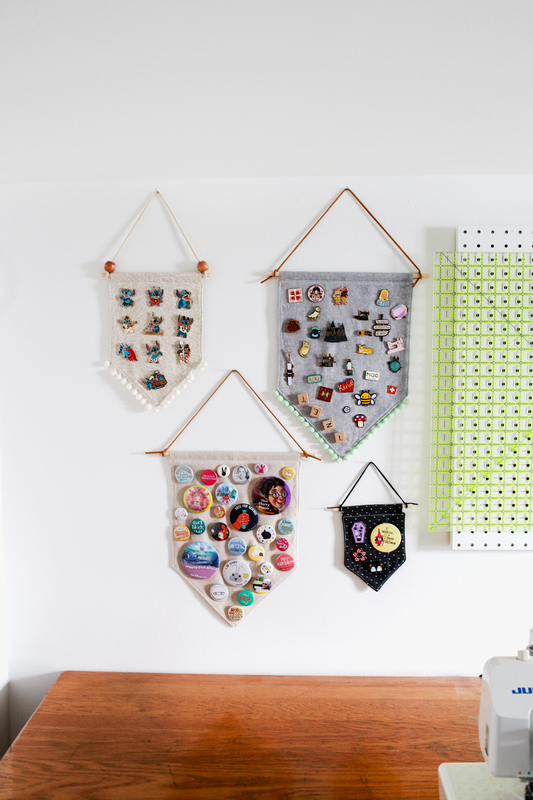 Find my tutorial to make these here: Enamel Pin Banner Tutorial. Right behind my sewing machine is my ironing station. I recently installed a metal curtain line (also from Ikea, can you tell we live 20 minutes from one?) on this wall to hang quilts, quilt tops, or a piece of batting as a makeshift design wall. And last but not least, one last DIY, a rug! The middle of the room is all open, so it's nice to have a rug there most of the time. It's a big room, which means I needed a big rug. With all the stray threads and messy crafts happening in here though, I didn't want to spend a lot on a rug. So, I decided to make one by stitching together some cheap runners from Ikea! The bonus is that it's not super heavy, so I can easily roll it up and out of the way when I want to baste a quilt. 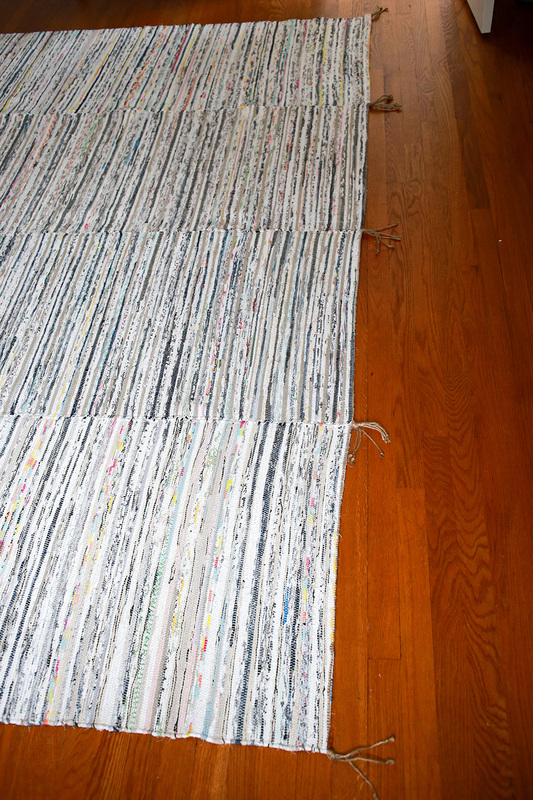 Find my simple DIY for this here: Sewing Room Scrap Rug Tutorial. 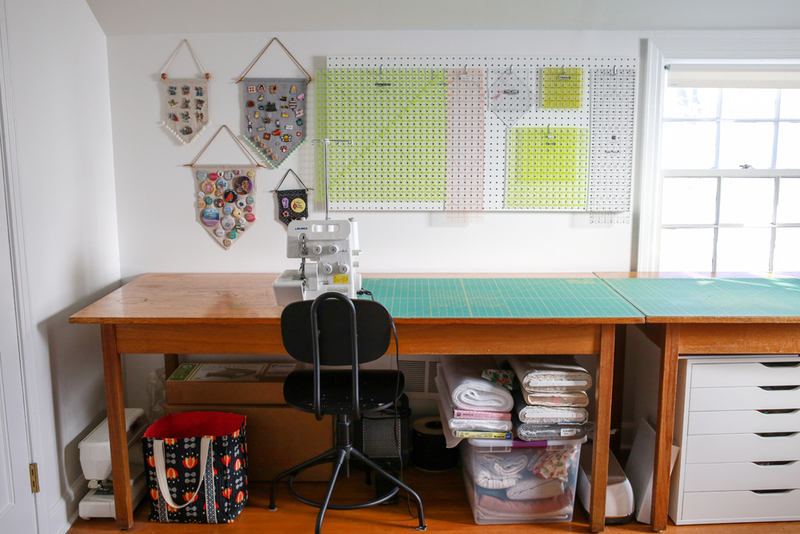 I hope you've enjoyed this tour around my sewing space! I've totally enjoyed this lovely tour of your sewing room. 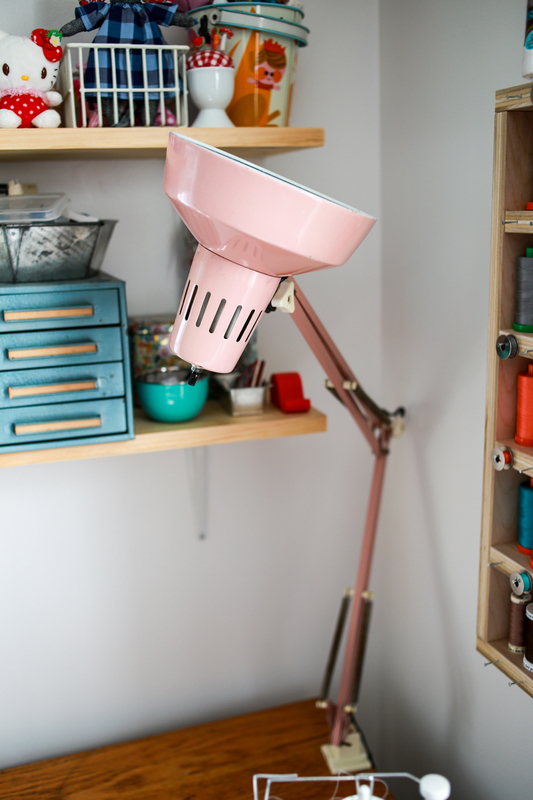 Natural lighting is one thing I do miss in my sewing room, but it too is a cosy place. 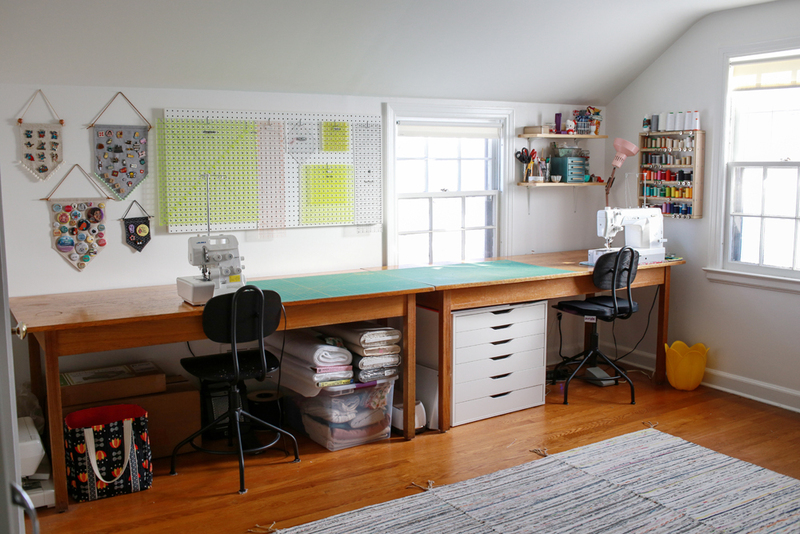 Your sewing room is awesome :)! Love those tables and the way you have it all organized. Beautiful fabrics and storage spots for all. Thanks for the tour. I think you are really loving your new home. What a fantastic idea on the rug! Rugs are so expensive in bigger sizes and putting a few together is an excellent idea. Beautiful sewing room. Great inspiration to use in mine. Thanks for the tour. Very fun and some good ideas. What a wonderful space! 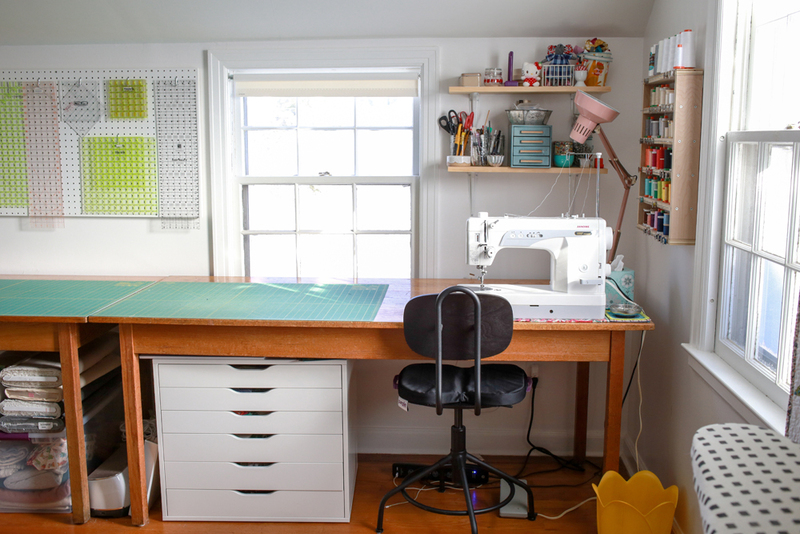 Lovely sewing space!! The thing that caught my eye? Your yellow tulip trash can! There's a pink one just like it in my studio. I've had it since I was a girl. This is great! Your room is so awesome! I have one of the big Ikea units (not sure if it’s Kallax or Expedit) so those Sterilite bins will come in handy since the cubbies are so deep. Thanks for sharing! 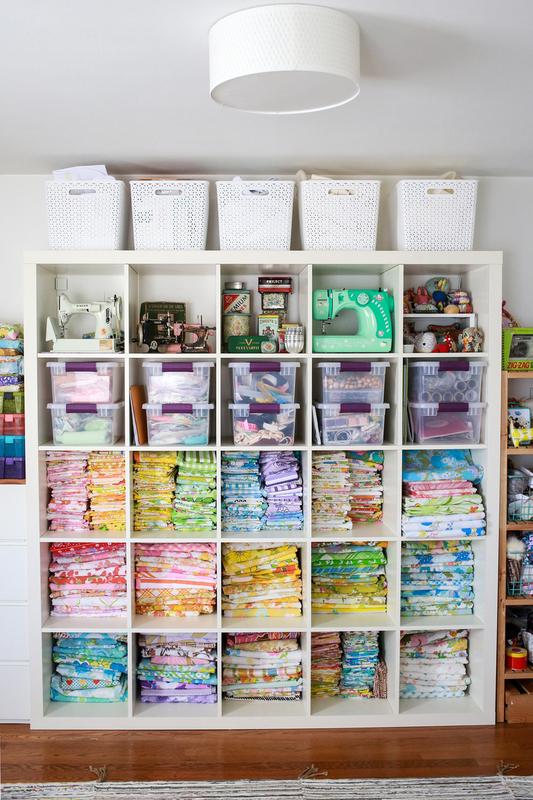 Loved seeing your sewing room and organizational strategies. Thank you! What a great space! I loved seeing it; thanks. OMG, you've got it bad girl! Now I want to build me a small barn so I can have a sewing room. I'm 63 and retired and I knit, crochet, cross stitch, quilt and now my next project is making me some linen tunics for the summer and then some long nightshirts and robes for next winter. Thank you for the tour. You have a wonderful workspace. Hi I am also 63yr and retired and how wonderful we can work on all those projects we dreamed of!!! I am currently working thru my stash, so I don't leave much to anyone!! They will get my equipment and finished projects!! Thank you for the tour Jeni.Your sewing room is lovely. Your storage cabinets are perfect. Well done. 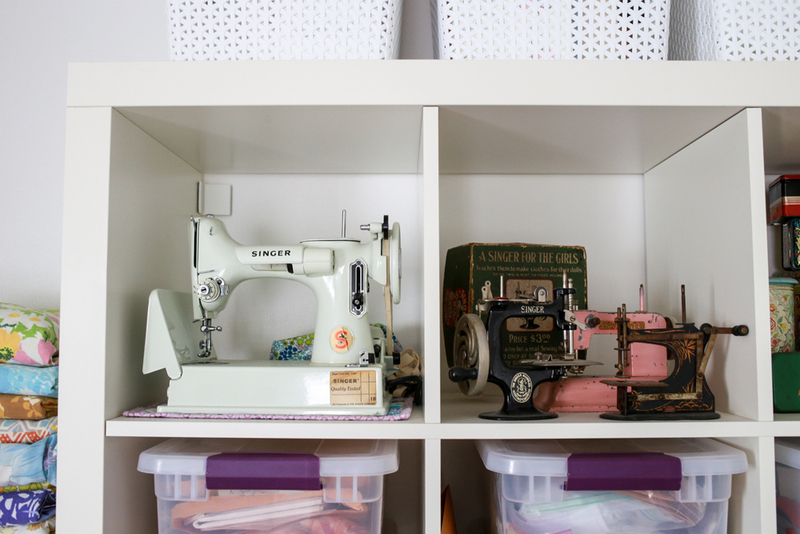 Truly, an organized and tidy sewing space is helpful in so many aspects of being inspired, making and completing work. What are the room dimensions? It looks great! Thank you for sharing your fabulous sewing room. I enjoyed your pictures very much. Happy sewing! I love IKEA too, have the same cabinet that is just to the left of your sewing machine. I noticed you took the roller off so it would fit under your table. Great idea. I love a well planned and functional room. Bravo!!! LOVE the tables your dad got for you. I got mine at Ikea (basic desk with two thin drawers) along with a hutch that is similar to your fabric storage but has drawers on bottom & glass doors on top. I'm curious how you like your hardwood floor in there? We re-floored our whole house 2 yrs ago and, after a lot of flip-flopping, I finally went with carpet in my sewing room. I have some pretty bad back issues and was worried about standing on the hard floor; also worried about the amount of fuzz/lint showing constantly. I knew it would be an issue trying to roll my chair back from my sewing desk but honestly, it's driving me nuts now and I can't believe I'm thinking of having new carpet pulled but I just might, esp while our wood flooring is still available and I can always wear cushy shoes! Any thoughts? Thanks! I don't mind the hardwood in there, I have had carpet in my previous sewing rooms. It does show more dust bunnies/threads, but I keep a small broom and dust pan in the room to sweep those up. I haven't had much pain from standing, but I have also really trained myself to mix up my tasks so that I'm not doing one thing for too long. I do wear shoes when I'm up there, so that does help! If I have a lot of ironing to do, I'll lower it and do it sitting. If I had to choose, I'd choose hardwood again! Love to know how you fold your fabric to fit in the Billy bookcase! 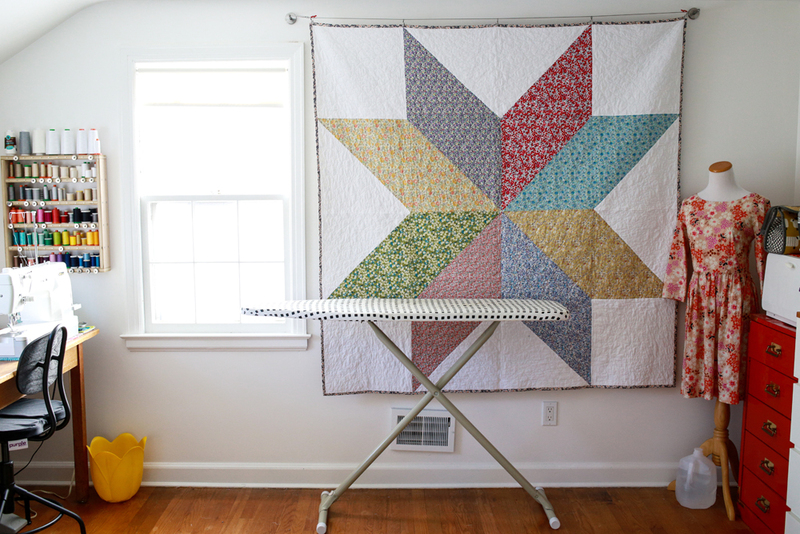 Are those fat quarters, or do you usually buy a set yardage to fold in a specific way to fit so nicely? I have carpeting in my sewing room and I love it. However, the person who installed it told me to get a plastic carpet mat to protect the carpeting from rolling a chair over it repeatedly. That makes it easy to roll the sewing chairs back and forth. What a lovely room. Would you believe, I have a whole separate building for my sewing? It a bit full of storage right now, because when my mom lived with us for a year, I had to pack up my home office/library to make her a room in our house. She has passed on, but the grandchildren have commandeered the room. The main sewing area is still set up, but because we live in an area with a long snowy winter, I can't get to so easily in the winter months. I have on one wall, four sewing machines. My Kenmore from 1977 when I graduated from design school, which has never needed any repairs in all these years. Then I have a Juki serger, an industrial blind hemmer, and an industrial straight stich, the industrials were my mothers.I use a rolling office chair to roll up and down my row of machines as needed. On the opposite side of the room I have a cutting table with mats and a pegboard above it. I can roll from my machines to the table in a quick turn, which makes it great. I have 6 windows and two southern skylights, which makes it quite nice in the daytime. I love your space. I had something very similar before we moved. Maybe some day. It’s a wonderful creative work space. I have to be near a window too!